Multiple sclerosis can cause several problems that affect vision. Blurred and deteriorating vision is a very common occurrence. The reason is almost certainly caused when the myelin sheath develops scar tissue after being damaged during an auto-immune-system attack. 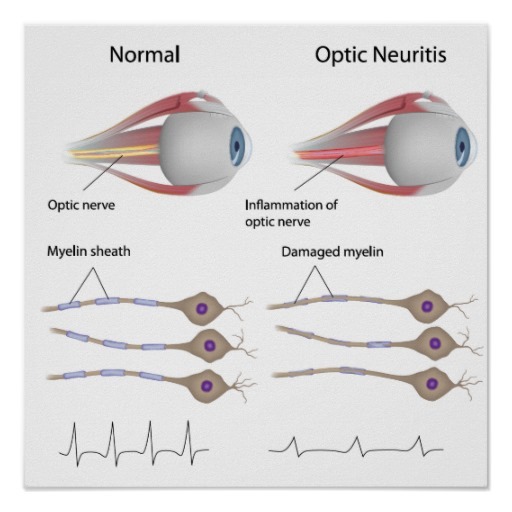 Optic neuritis is one example of a common MS-related eye problem. It is often the first symptom that people with MS experience. Optic neuritis is caused by inflammation or demyelination of the optic nerve, which transmits the image from the eye to the brain. Although optic neuritis generally tends to affect only one eye in people with MS, it can affect both eyes. This can either be both eyes at the same time, or one eye after the other. Frequently there is pain, particularly during eye movement, often accompanied with a temporary partial loss of vision. Double vision (diplopia) is another potential early symptom of MS. Double vision occurs when the nerve pathways that control eye movements are damaged. Nystagmus is a condition in which the eyes are seen to move in a more or less rhythmical manner, from side to side, or up and down. If it is more persistent, nystagmus may contribute to dizziness or nausea. HealthPoint acupressure treatments for Multiple Sclerosis are performed according to each patients signs and symptoms, as MS follows a loosely defined progression, in most cases, meaning that each patient may suffer different sets of typical symptoms, in differing patterns, often with periods of remission. The stage of Multiple Sclerosis mostly related to vision is Stage I. Initially symptoms in Stage I usually begin with visual disturbances a/or a period of muscle weakness, which can include muscles around the eye socket. This may clear up on its own, or otherwise may need treatment, which can include HealthPoint treatment, whereby the patient may not experience any more symptoms for an indeterminate duration.